How do I search the Online Catalog? What is meant by browsing indexes and browsing collections? What kinds of information will I find in the online catalog? Are all of the Archives' holdings described in the catalog? What is meant by the "level" of search? What information will I get when I enter my search? Can I get additional information on a record in the result list? Is there more specific information available about the contents of a series or collection? What do all those numbers in brackets mean in the Detailed Listing? Can I request materials that I find in the online catalog? How was the catalog designed/built? 1. How do I search the Online Catalog? 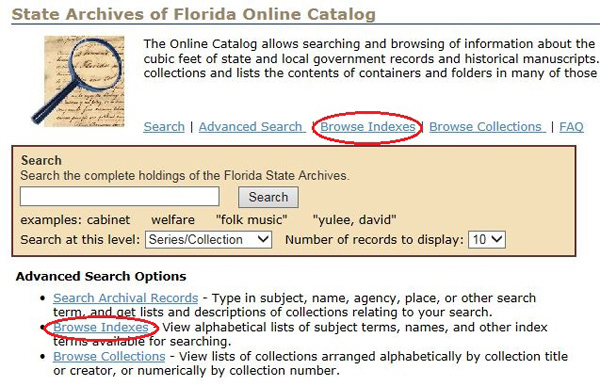 You can perform more complex searches by selecting "Advanced Search" or "Search Archival Records" from the main search page, or by selecting "Advanced Search" from any other catalog screen. (See Example 1-2) This will bring you to a screen on which you can enter multiple search terms to broaden or narrow your search. (See Example 1-3) This screen also offers search tips and descriptions of the types of searches available. Examples of each type of search are shown under the typing area for each search type. 2. What is meant by browsing indexes and browsing collections? 3. What kinds of information will I find in the online catalog? 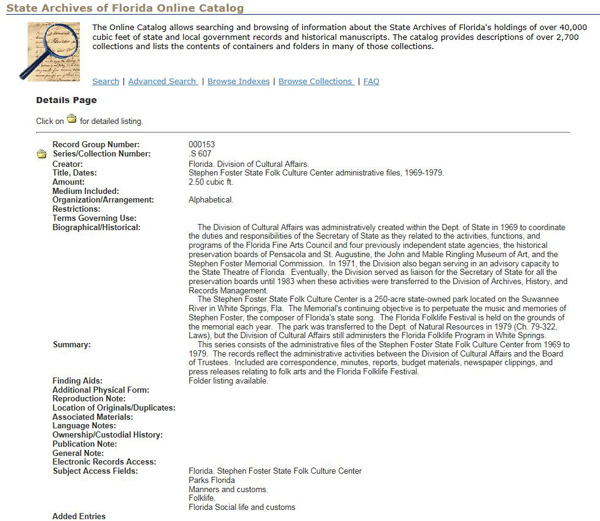 The online catalog provides information about the origins, arrangement, subject content, and physical characteristics of collections included in the Florida State Archives' holdings of over 40,000 cubic feet of state and local government records and historical manuscripts collections. The catalog provides descriptions of over 2,800 collections and lists the contents of containers and folders in many of those collections. 4. Are all of the Archives' holdings described in the catalog? Yes, but descriptions for fully-processed collections will be more detailed than those for collections not yet fully processed. Most descriptions of the Archives' holdings include lists of container titles and often folder titles as well. Over 91,000 photographic images of Florida people, places, and events are available for searching and viewing on the Florida State Archives' Florida Photographic Collection page at http://www.floridamemory.com/PhotographicCollection. 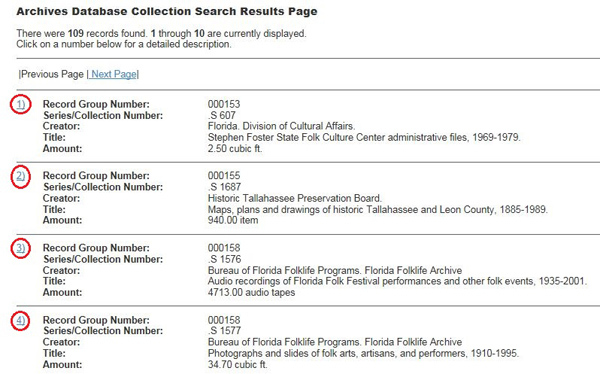 Over 13,000 complete files comprising the Florida Confederate Pension Application Files have been scanned and are available for viewing at http://www.floridamemory.com/Collections/PensionFiles. Over 6 cubic feet of historical manuscripts comprising the Call Family and Brevard Family Papers have been scanned in their entirety and are available for viewing at http://www.floridamemory.com/Collections/CallBrevardPapers. The papers include correspondence, writings, and other papers of Richard Keith Call, territorial governor of Florida, and his family. The collection offers highly significant and unique documentation of Florida's territorial, early statehood, and Civil War history; the development of early Tallahassee; issues and attitudes concerning slavery and race, and Union and secession; and the effects of the Civil War on the lives of planters of the Old South. Particularly significant among the Call papers is correspondence between Richard Keith Call and Andrew Jackson. 5. What is meant by the "level" of search? The largest grouping, the "record group," refers to all the records created by a particular department or organization. For instance, all records from the Department of Transportation together form the Department of Transportation record group. Record groups are comprised of multiple subgroupings known as "series." A series is a set of records that documents a particular function, activity, or program of an agency, office, or organization. For instance, within the Department of Transportation record group, there might be a series of "highway planning maps," and another series of "road surface research files," and another series of "transportation legislation development and tracking files," etc. Within each series are smaller groupings of records. Each series usually consists of one or more containers; each container usually consists of one or more folders; and each folder usually contains one or more documents or other items. 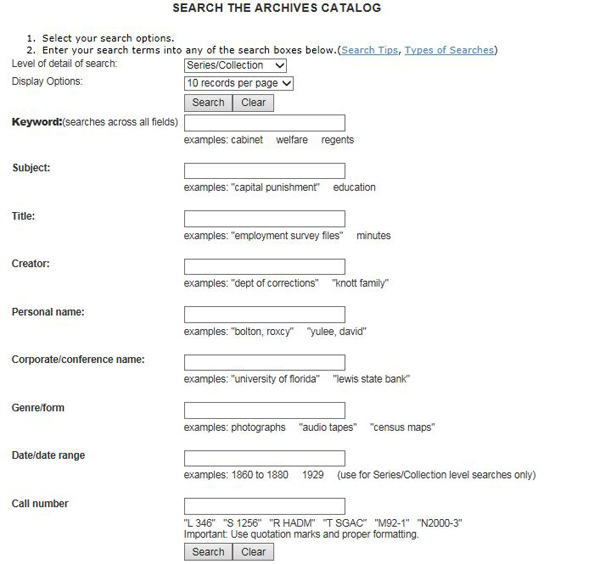 The online catalog is capable of searching for descriptions of record groups, series (or "collections" for manuscript materials), and boxes/folders/items. We recommend that you begin any research project by searching at the series/collection level (the default setting). This will give you the best sense of the most significant available resources relating to your research project. 6. What information will I get when I enter my search? 7. Can I get additional information on a record in the result list? 8. Is there more specific information available about the contents of a series or collection? Yes. Most descriptions of the Archives' holdings include lists of container titles and often folder titles as well. To see any available container or folder listing for a particular series or collection, click on the folder icon to the left of the "Series/Collection Number:" label. (See Example 8-1) This will bring give you a "Detailed Listing" screen providing a list of the containers comprising that series or collection, and sometimes listing the folders within those containers. 9. What do all those numbers in brackets mean in the Detailed Listing? The second entry is the series/collection number (with the record group number as a prefix), such as [000450/.S 164], followed by the series/collection title. If folders are listed for the container, each folder title is preceded by a five-digit folder number (with the record group, series/collection, and container numbers as prefix). For example, [000450/.S 164-00001.00014] means Record Group 450, Series S 164, container 1, folder 14. This numbering scheme [Record Group /Collection.Series -Container.File Unit #Item] follows throughout each �Detailed Listing� screen. 10. Can I request materials that I find in the online catalog? 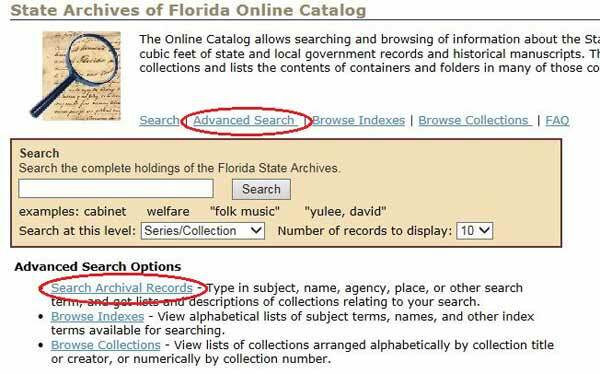 You can let Archives staff know of your interest in using materials you find in the online catalog by sending an e-mail to archives@dos.myflorida.com, or by calling our reference staff at 850-245-6700. Include in your request the series/collection number and title, and the box and folder numbers if appropriate. This will allow our reference staff to confirm the availability of the materials you wish to use and to let you know of any restrictions or other conditions of use of the materials. Because the Archives' collections are unique and irreplaceable, they can only be used on-site at the State Archives research facility in Tallahassee. Registered Archives researchers can create and print pull slips by clicking on any container, folder, or item entry listed on a "Detailed Listing" screen (see #8 and 9 above for information about the "Detailed Listing" screen), entering your 7-digit patron number (use as many leading 0s as necessary) into the "Enter Patron ID:" box, and clicking on the "Create Pull Slip" button. 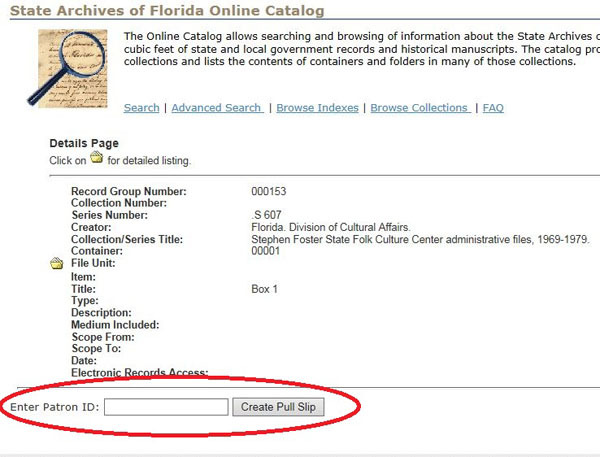 (See Example 10-1) You can then bring the pull slip to the Archives and provide it to our reference staff, who will be able to retrieve the records quickly using the information on the pull slip. 11. How was the catalog designed/built? 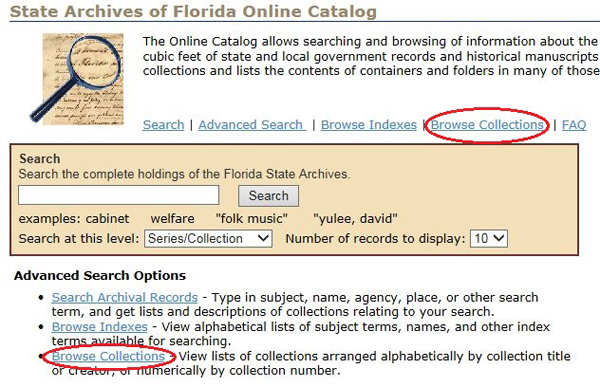 The Florida State Archives uses a software package called Re:discovery, designed and customized by Re:discovery Software, Inc. (RSI; see http://www.rediscov.com/ ), to perform archival collections management and cataloging functions. RSI's web interface allows search and display on the World Wide Web of descriptive cataloging information from the Re:discovery database. 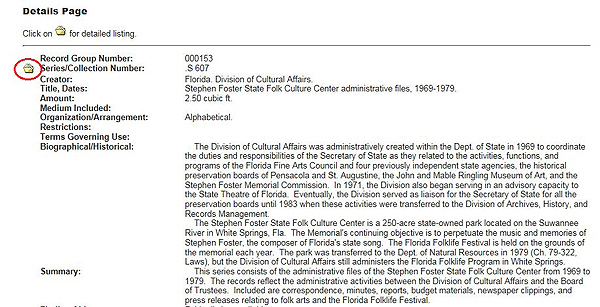 The screen appearance of the Florida State Archives web interface is based on requirements provided to RSI by the Florida State Archives, with some minor modifications made by Archives staff.